In 2014, John Tory, mayoral candidate, promised to deliver a 58 kilometre-long “London-style surface rail subway” that would provide much-needed relief to the overburned TTC subway system. In 2016, we finally know how unrealistic Tory’s transit fantasy turned out to be. The province announced several new stations along its existing GO Transit lines, which will serve Metrolinx’s Regional Express Rail (RER) trains. At best, SmartTrack — John Tory’s signature transit plan — represents the City of Toronto’s buy-in to GO RER, a worthwhile project to provide better rail service to suburban Toronto and the 905. But at worst, SmartTrack is a failure to deliver on a key election promise, as flawed as it is. 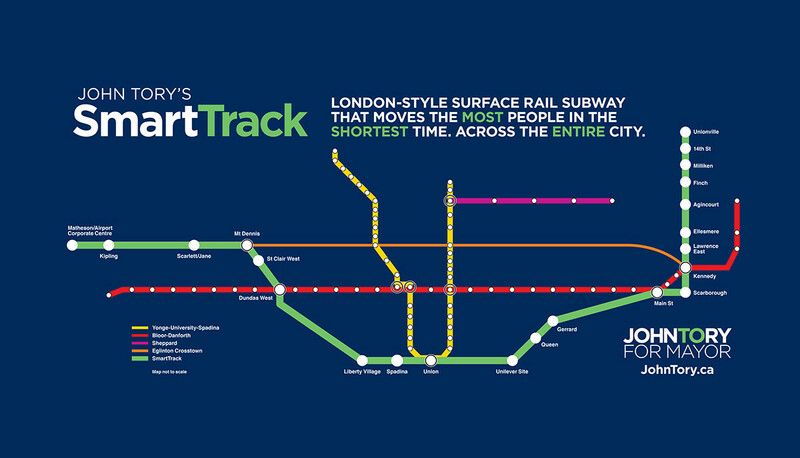 But in order for the Mayor to save face, the SmartTrack brand will likely never go away. I write more about the latest transit developments in Torontoist. This entry was posted in Politics, Toronto, Transit and tagged John Tory, SmartTrack, Torontoist. Bookmark the permalink.